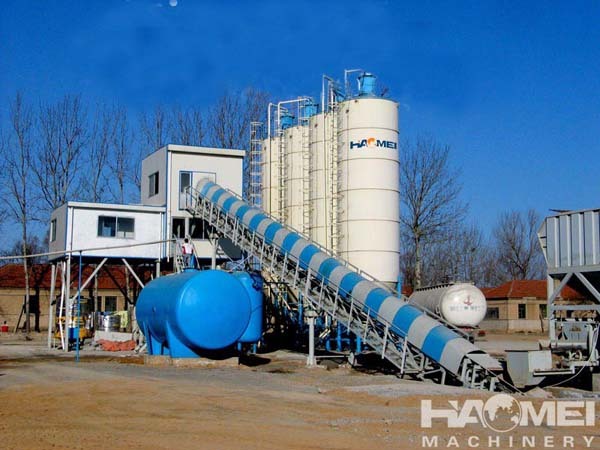 With the development of demand in buildings, roads and other markets, concrete mixing plant is applied more widely, as a high-return investment projects, investors need to know about before Website mixing plant siting process. After selecting the site, using excavators to remove surface debris and mud, stacked and transported to the designated site. In the top of the hill ready before excavation drainage ditches, and depending on the soil conditions make the work of seepage. Excavation must be top-down excavation can not be digging, digging over and under-excavation, excavation should pay attention to the top surface of the site reserved for highly compacted settlement, when faced stonework, using hammer construction. After the excavation to the design elevation, rolling smooth dense, reach carrying capacity requirements using stone tablets of replacement. Second, three: 0.3m + 0.2mC25 water stable layer of concrete. Batching plant, silo basis only with Piled, pile cap dimensions of 5 × 5 × 1m, each pile cap set of four 1.2m diameter pile, pile embedded in rock weathering is not less than 4m, using C30 concrete pouring . Stockyard is arranged at the rear side of the mixing station host, is divided into six silos, sand two positions, four stone warehouse, divided silo wall using “37” height masonry wall is not less than 1.8m, and with cement mortar Plastering, the warehouse floor to set a 5% slope of the ground, reserved holes divided silo wall under the water to avoid the various silos zoning clear, set the nameplate material, size 40 * 750px, indicate material name, origin, specifications, units of measurement, quality status. Installation of water pipes at the edge of the bunker, so rinse it under the premise of contaminated sand and gravel. Mixing station to take closed-end management, according to the actual situation, surrounded by brick walled closed wall 24, high 2m, 6m a brick masonry column spacing intervals, the top brick column cap. Import and export setting the guard room, and hung generated safely and quality banners and flags plug. Venue construction set signboard. Mixing station site at the time of flat ground and hardened sites, the overall control of drainage to both sides, set to 3% longitudinal slope, arranged around 40 × 40 drains the venue, the venue to ensure smooth drainage; six in hardened silos site when do single outside 5% drainage slope so that water straight through the silo site Longitudinal discharged into drains; mixing station master drainage must be set sedimentation tanks, waste water in order to clean mixer after precipitation into drains. Utilization set 60 × 40 drains.